Plan a Getaway- Up to 75% Off Cruises! Posted on April 19, 2010. As the weather begins to warm up, the long days in the office are beginning to make everyone a bit antsy. 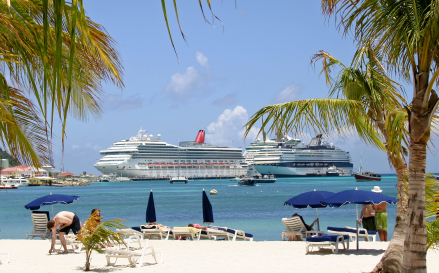 Spring break just passed and now, the ideas of vacation are creeping around in our brains- why book not a cruise? When it comes to cruises, there is something for everyone. Whether it be a Disney and Bahamas cruise with the kids and family, a sight-seeing trip to the Greek Isles, or if you simply want to see it all- a World Cruise. Some of us on the other hand, are looking for somewhere to cool off from the heat, making Alaska or an Arctic cruise more appealing. Not looking to spend a lot of money on a vacation? With prices as low as 75% off, Vacations To Go helps you save money without taking away your valuable vacation time. For over 25 years, Vacations To Go has been dedicated to helping you save by offering the widest selection of cruises available. This has allowed more than two million travelers, like you, to save immensely on their travel plans. In the beginning, the purpose was to partner with the largest cruise lines as a means of booking their unsold cabins. However, instead of introducing them at a “sale price” Vacations To Go would make exclusive offers to their clients at steeply discounted rates—Up to 75% off. Their efforts have proved to pay off. Whether you are cost-conscious with a flexible schedule or looking for some early-bird bargains, it’s worth signing up. Getting on this exclusive list is easy -and free- just log on to the website and register to become a member. You will gain instant access to their great offers and discounts! Once you’re on the site simply click around. A “90-Day Ticker” gains access to last-minute cruises at a whopping 50-75% off or click “Find A Bargain” for a selection of offers such as 55 and over cruises, or 2-for-1 early-bird specials. Cruises are also available for honeymoons, weddings, corporate affairs, large group cruises, or grand voyages to “exotic” locations. What’s more, the website offers deals for singles, firefighters, police, military personnel, teachers, and yes, past guests too! Vacations To Go can be used as a resource for its travelers as well. Click around for additional information on passports, packing, tipping, dress codes, first time traveler general information, a guide on what you get for what you paid, even a layout for each ship so you can see what you’re getting. Offering the widest selection of cruise lines and destinations to every corner of the world at the best prices, Vacations To Go is the place to go. So whether you’re young or old, looking for warm or cold, visit us at VacationsToGo.com to book your getaway today. ← Put an End to Snoring… and Risks You May Face!